The Kowa Prominar Genesis XD 10.5x44 binoculars are manufactured in Japan using the highest standards as well as the best quality components and optics available. It also means that these Kowa Genesis binoculars are aimed at the high end of the market designed to take on the best and likes of the best Zeiss, Leica, Swarovski and Nikon binoculars. Because of this and the fact that they have slightly larger than the normal 42mm normal objective lenses as well as a powerful 10.5x magnification meant that I really looked forward to putting them through their paces. The outstanding feature of all the Kowa Genesis XD Binoculars and is obviously included in this 10.5x44 version is the use of optical technology taken from the Kowa Spotting scopes and mainly the PROMINAR XD lenses to produce a binocular that is according to Kowa chromatic aberration free. The body of the binoculars is made from magnesium alloy and covered in a rubberized armour that give you a tough binocular that should easily handle most conditions that you throw at them. On top of this they are completely sealed and filled with dry nitrogen gas to prevent them from fogging up and mean that they are 100% waterproof. Although if you read the small print they are not intended for underwater use! One of the small criticisms of the Genesis XD44 binoculars and even though Kowa have used a Magnesium alloy body that they say "decreases the weight of the binocular", at 34.0 ounces (965g ) they are one of the heaviest full size binoculars that I have reviewed. I think it is one of the reasons they have since brought out the Genesis XD33 binoculars which weigh in at a lightweight 20.8oz (590g). To be honest at first I did not notice the extra weight which I think is a testament to just how comfortable and well balanced they are to hold and in some ways it makes you feel that you really have a solid quality binocular in your hands, but I would imagine that they could start to feel heavy during long periods of observation if you do not have something to rest your elbows on. Focusing was really smooth with the large centrally located focusing knob and the comfortable twist up eye-cups provide you with a good 16mm of eye-relief, which means that they just miss out on my own personal benchmark of "Long Eye Relief binoculars", but should be plenty enough for most eyeglass wearers. The lockable diopter control is a nice touch that will keep your setting from accidentally being changed. Another nice touch are threaded objective lenses that allow you to add 46mm filters to the front of the lens. The Objective Lens covers are attached to the body of the binoculars via a rubber ring that fits tightly around the barrel and definitely will not be lost accidentally, whilst you can remove them should you wish. Making use of technology from the popular Kowa TSN spotting scopes, the two binoculars in the XD44 series were the first full size binoculars from Kowa to use to use Prominar XD lenses (extra low dispersion glass). On top of this they have paired these XD lenses�with convex lenses made of glass that also has special dispersion properties that is said to reduce chromatic aberration even more. These ultra high quality lenses are not cheap to manufacture and so are only used on Kowa's top end binoculars, the result however is an extremely bright image with high contrast. During my test I found that the colours you get when looking at objects like bright flowers and birds were simply stunning, almost better than real life. This effect cannot be duplicated by a normal achromatic lens and you can see the difference when comparing them with binoculars without this technology side by side. As with any binocular in this price range you would expect them to have BAK-4 prisms that are made of superior optical glass to produce clearer images, but Kowa have gone one step further in that they use the Schmidt-Pechan prism design that have both BaK4 and SK15 prisms. This prism design, like roof prisms is more compact than a porro prism binocular, but does have a few drawbacks one of which that the two prisms separated by an air-gap and one surface of the Pechan prism does not provide total reflection. To get around this Kowa have added their own highly reflective multi-coating that they call C3 coating that they say give a reflectance of 99% or more across the entire visible spectrum. On top of this Kowa phase coat the prism that prevents the loss of contrast and resolution. To go into a little more detail, Phase-correction coatings help to reduce the phase shift of light caused by phase differences arising from total light reflection on a roof surface! Sounds complicated, but basically it keeps the light in correct color phase and has the result of reducing the loss of image resolution to maintain high-contrast images. It is a feature that is only found on high end roof prism binoculars. The larger 44mm objective lenses are said to be 10% brighter than 42mm versions which I can't verify, but if true is impressive, making them work even better in poor light conditions and you hardly notice the difference in size when holding them. The field of view at 1000 yards is 323.7ft (108m@1000m) is good and is comparable to most top end roof prism binoculars that only have a 10x magnification. They have a close focus distance of 5.5 feet (1.7m) which is excellent, beats most other binoculars in their class and even competes with binoculars specifically designed for things like viewing butterflies. Whilst the humble neck strap does not usually warrant having it's own title on most of my reviews, I think that the one that comes with the Kowa Genesis is that good that it is well worth bringing to your attention. What I like about is that it is very well made, has a thick sponge padding and at it's central point that sits behind your neck is wide enough to distribute the weight over a larger area, making carrying the binoculars very comfortable. It also shows that Kowa have not forgotten the fine details and finishes off the optics properly rather than just being an afterthought. Below is a table comparing some of the main features of the Kowa Genesis 10.5x44 XD binoculars with what I believe to be the market leaders and what this Kowa is competing with, the Swarovski 10x42 EL Binoculars and the Nikon 10x42 EDG's. So as you can see all three binoculars are fairly evenly matched and all three have their strong and weak points. Strong points for the Kowa is it's price and really good short focusing distance. As discussed earlier it suffers a little in the weight department and has a slight smaller field of view, but remember you do get a slightly stronger 10.5x magnification. Standard 10x42 binoculars like the Nikon and Swarovski above have an Exit Pupil of 4.2 and a Twilight Factor of 21, both of which are not brilliant, but fine fine for most low light conditions like twilight. (I often use a 10x42 binocular on game drives that either end just after sunset or leave at sunrise without any problems). Whilst the Kowa with even with it's slightly more powerful magnification still has an exit pupil of 4.2 (4.19 to be more exact), yet has a slightly better twilight factor of 21.5. This is because of the slightly larger 44mm objective lenses that let in more light than 42mm ones. It is however important to remember that these figures do not take into account the quality of the lenses, prisms and their coatings that is why not all 10x42 binoculars are the same brightness, you can also be sure that all three of the above binoculars use the highest quality optics. But the figures do make it possible to compare the possible performance of the different dimensions of binoculars in low light conditions. Overall these are a fantastic pair of binoculars, ideal for nature observation, excellent safari binoculars if you are not worried about size and make great bird watching binoculars. They will also work well as general use and sports optics. The incredible quality of the optics mean that the view through them is nothing short of sensational and definitely some of the best and brightest binoculars with a magnification of 10x or more that I have ever used. 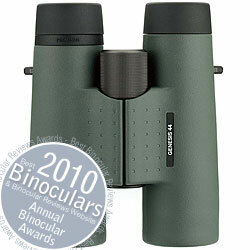 The feel of the binocular in your hands is nice and balanced and the rubber coating is very comfortable to hold. On the down side, they are a little on the heavy side and if you feel that this is an issue, I would take a look at the new Genesis XD33 binoculars and the Kowa 8x33 Genesis XD Binoculars in particular. For comparison the image at the bottom of this page shows the difference in size between the Genesis XD44 binoculars and the XD33's. I would like to thank Alpha Digital Services Limited, the UK distributors of Kowa Binoculars for providing me with the Kowa Genesis XD Binoculars to review. Leica set the standard when it comes to quality and if price is not a factor, these could just be the ultimate wildlife and safari binoculars.